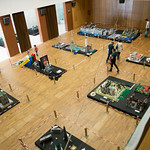 It’s hosted by the local LEGO Users Group, Communidade 0937 (look at that upside down and it spells LEGO) based in this town in northwestern Portugal. The closest big city is Vigo, Spain. (I made it an excuse to spend two weeks exploring the country of Portugal, and on the way there I stopped off in London for three nights … but that’s a story for my travel blog – coming soon – not here.) 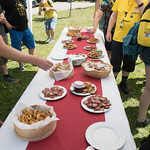 This event is based on the Fan Weekend held every year in Skærbæk Denmark, which I attended in 2014, and is done with heavy support from the town government. 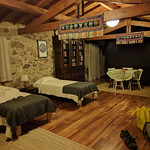 They provide exhibitors with lodging in nearby bed & breakfasts, all meals, and a generous goodie bag, all for only €100. For another €25 you get to attend a gourmet banquet at a fancy restaurant in the countryside on the Saturday night. It’s a great deal! 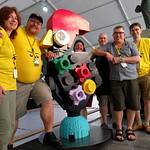 Plus you get to meet talented builders from all over the world – mostly from around Europe and the UK of course, but also lots of people from Australia that I knew from going to Brickvention in January, and other countries as well; there were only a handful of us from the US. 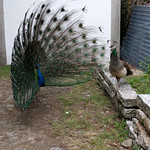 The lodging I was provided with was in a bed & breakfast which had a small flock of peacocks among other animals roaming the grounds, and we had to be very careful when opening and closing the gate so that they didn’t escape. 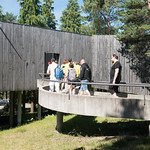 The venue is the town’s cultural center, a multi-use facility with a theater, gym, etc. In order to provide enough space, the town government assembled a temporary tent structure on the adjacent plaza, connected to the rest of the building. MOC exhibits were placed in the tent, gym, and hallways in between. The theater was used for presentations, and there was a lounge area where we could get away from the public, enjoy tons of free snacks and beverages, and mingle with other attendees. 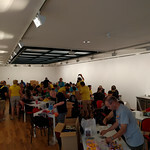 In practice, the builder lounge was largely used for making deals to trade with other attendees the contents of our Play Brick Boxes (PBBs) – surplus LEGO elements sold by the LEGO company at a deep discount which attendees could purchase on the first day of the event. (Getting my PBB home from Europe proved to be a challenge; I ended up having to pay almost €100 in postage as I couldn’t get it into my baggage allowance!) Except for the VIP dinner Saturday night, all the meals were provided in a dining hall a block away from the cultural center, which was fairly basic (but still tasty) cafeteria food. 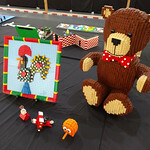 There were a lot of amazing MOC exhibits there, and I contributed to it by building my own relief mosaic version of the Galo de Barcelos (I’ll post about this MOC soon, stay tuned), a traditional emblem of Portuguese culture, as well as bringing my Teddy Bear, Q*bert, and Snoopy & Red Baron MOCs. 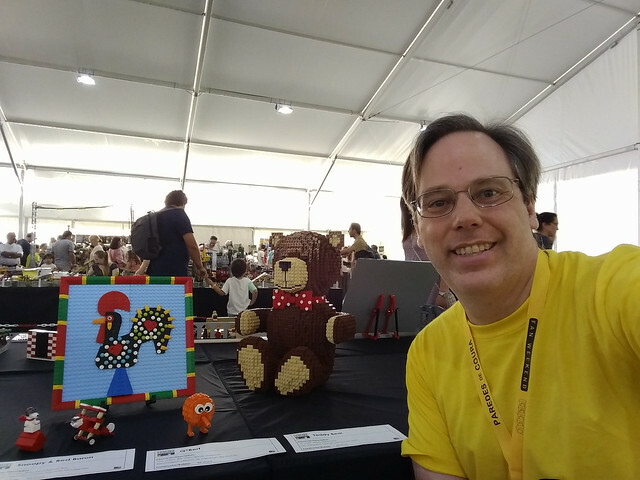 You can see photos of all the MOCs displayed on my Flickr album Paredes de Coura 2017 MOCs. 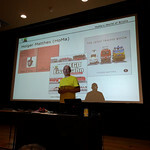 I saw a few presentations at the theater, on the history of the LEGO system and on third party parts for building trains. 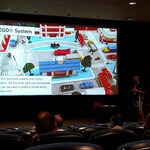 I also gave my Brick Geometry presentation, though I got the impression that the people attending were a lot more advanced than the audience that my presentation is targeting. 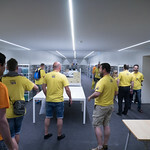 I also participated in a Micropolis build, where attendees had a chance to build some models using the LUG’s parts to the Micropolis standard, which will be transported to Denmark and exhibited at the Skærbæk Fan Weekend in September. I built a construction site, with a tower crane and a bulldozer. A big highlight of the weekend was the Clubhouse Tour. 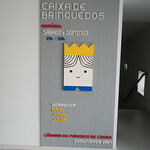 The town has given the LUG the space to use for their events in exchange for having weekend workshops for the local kids, called the Caixa de Brinquedos (House of bricks). The tour started with the workshop area, and then we went behind the scenes and downstairs to the parking garage level that has been converted for the clubhouse. They put in carpet and finished walls and ceiling, and the space is lined with shelves full of bricks. 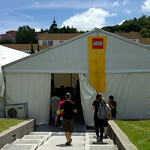 I’ve never seen such a large space for storing LEGO! 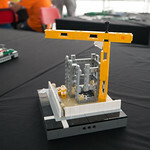 Club members can use the club’s bricks to build MOCs, and there’s even space to sleep if you live far away – they have two bedrooms with bunk beds, two full bathrooms, and a small kitchen. On Saturday night, there was the previously mentioned gourmet banquet. We all drove there in our respective cars – on my way there I had to stop for a flock of sheep that was being herded across the road! – and when we arrived there was mingling in the gardens with drinks. When they were ready to seat us, we all went into the dining room and found seats at large round tables. 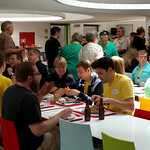 The food was brought out in courses, and featured traditional Portuguese fare. It was pretty good, but the service was slow (they had to feed the entire dining room at once, so it was understandable, but we got impatient waiting for it). There was a ton of food and the €25 price seems very low for what we ended up getting. However I found myself feeling a bit overwhelmed by the noise and boisterousness, and especially as the evening wore on as a non-drinker I became less and less comfortable, and I left early. Sunday morning, we took the “town tour” which turned out to be a bus ride out to an environmental center just outside the town. 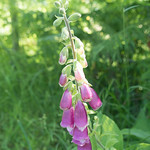 We saw a video about the center and then went for a walk down to a pond where there were frogs (croaking but not visible) and passing by wildflowers and pastures with grazing sheep. It was all quite lovely. The area used to be a planned agricultural village where the residents all lived in these little houses and shared a communal oven for making bread, and we ended up there for some snacks of local cheeses, bread, cured meats, etc. After the tour, the bus took us back to the town, and I went to the New Elementary workshop, in which we got to build some creations incorporating a handful of new elements as well as bulk brick that they provided. 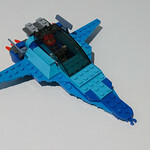 I built a little blue starfighter. We didn’t get to keep our creations but we did each receive a bag with samples of the new elements. Sunday concluded with the completion of Warren Elsmore‘s Ricky the Rooster sculpture. This is a scaled-up version of the mascot for the PdC Fan Weekend, a version of the Galo de Barcelos. 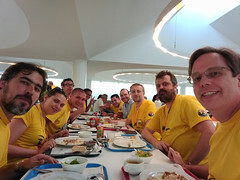 After one last meal in the dining hall, we all dispersed – I went to Vigo to spend a day there before flying back home (via Lisbon and Frankfurt, Germany). See all these photos and more from the convention Flickr album: Paredes de Coura 2017 Convention and as mentioned above, the MOCs have their own Flickr album: Paredes de Coura 2017 MOCs. 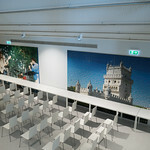 All in all I had a great time visiting Portugal and attending this event, and I hope I can make it there again soon! 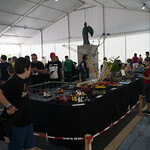 I would like to know about MOCS or set of LEGOS inspired by constructions of Latin America, which really exist? This was in Portugal, and most of the MOCs there were by Europeans. There is a LUG in Brazil though, but I’m not as familiar with their work. Sorry I don’t have any ideas for you.